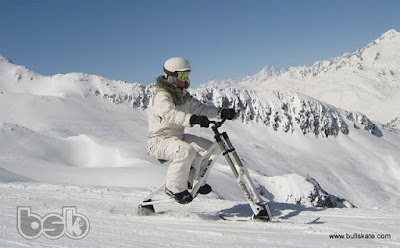 I recently received an e-mail from Dirk Van Borm asking if I knew if it was possible to skibike at Risoul, which is located in the South East of France, near the Italian border and accessible from Milan or Marseilles airports. As I didn't have any relevant experience, I passed the request on to Olivier Wagner of the French Skibike Club who was able to open negotiations with the resort management. To my great surprise Olivier mailed today to announce that "we now officially have the right to use our snowbikes in Risoul". Combined with the neighbouring resort of Vars, Risoul offers almost 180 km of piste that should keep most people happy. The two resorts make the La Foret Blanche ski area. The resort is more low-key than many of the Alpine resorts but it should not be overlooked. 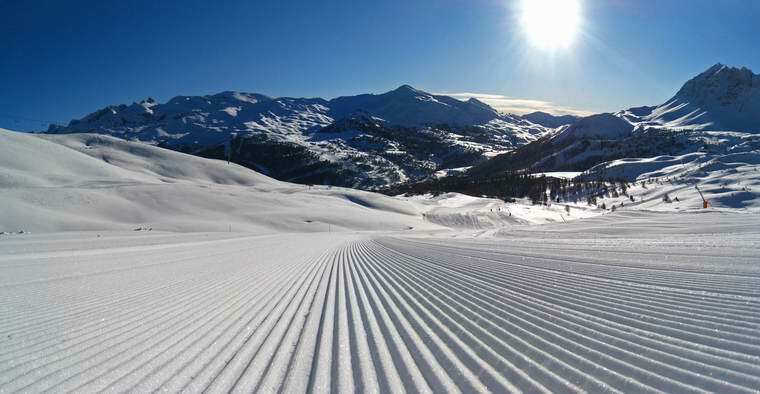 Risoul boasts a good snow record and the off-piste opportunities are plentiful. Experts may look at the piste map and be disheartened but there are plenty of steep runs out there that are unmarked. This just sums up the understated nature of the Risoul. One possible criticism is the relatively slow lift network. However, this is being upgraded over time. Off the slopes, the village of Risoul seems to be friendly with less of the attitude that can be found in some of the bigger resort complexes. You will will often see the big 4x4s, pickups and sundry SUVs, around the Alpine resorts. However; chances are that the piste bully driver who had to start work at 6pm, the person who delivered the groceries at 6am, or the local housewife getting the kids to school can't justify the running costs of such gas guzzling behemoths. 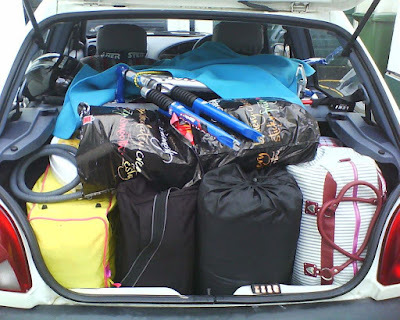 Time and again, I have seen them driving small, economical, front wheel drive hatchbacks or "breadvans"; they will have winter tyres fitted and will carry snow chains for when the conditions get treachorous. They may even have opted for an extra inch or two of lift on the suspension to clear mounds of accumulated snow. But the bottom line is that, providing you can get traction, the difference between 50 and 500 horsepower is negligable in getting you to the top of the hill. The mountain rescue services have favoured the humble Fiat Panda 4x4 for years, over bulky and overly complex rivals. For my Alpine adventures I had to use a Ford Fiesta Mk4 Encore model, this, I believe is the most basic variant you can find. The windows wind up and down on a handle just like they did on the Ford Anglia and the engine is of the same vintage. There is no power steering, climate control or reclining hubcaps. But above 1000 metres when the temperature drops below freezing, less is often more. Less electrics mean there are no needless drains on the battery, with no power steering you have much more feel through the steering in slippery conditions and who needs air conditioning when its -10 degrees outside. The el cheapo brand tyres fitted to my car were hopeless in most conditions; yet the addition of a pair of snow chains costing less than a single 4x4 tyre, it was transformed into a crude but cheap "go up anything" machine. It may not have been the fastest vehicle up the hill, but at 40+mpg, who cares. Once you are in serious mountain country, nature dictates how you live your life. The pattern of snow fall, ice, frost, sunlight and darkness will determine where you go, what you can do and the speed at which it will happen. If you think otherwise, you are probably the victim of slick TV advertising campaigns, aimed at those who will never take their shiny 4x4s any further than the nearest golf club or supermarket car park.